I was reminded again today of what a blessed life I lead. 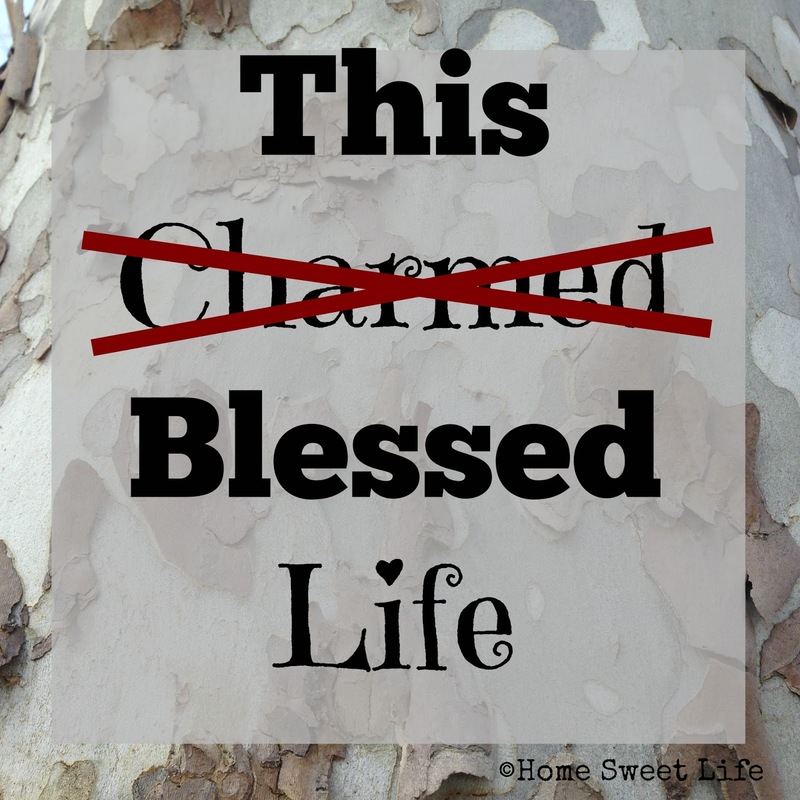 Those who don't know Christ might call it a "charmed" life, but I prefer to call it what it is - blessed! I'm not a pencil pusher, nor do I have to contend with rush-hour traffic every day. For the most part, I get to set my own schedule at work, and the girls don't have to catch a bus at 7 a.m. 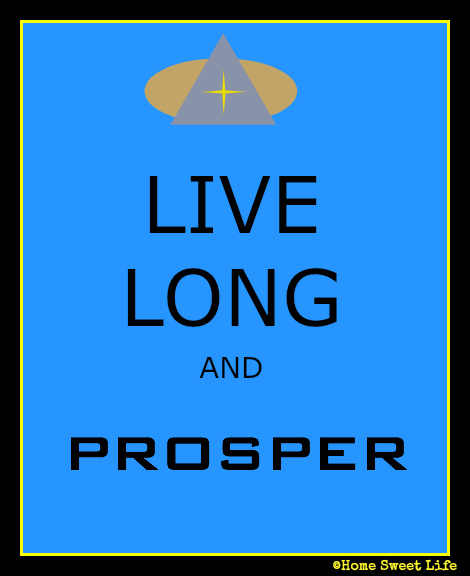 This home educating life isn't any easier than the next life, in fact, at times, it may be more difficult, but I would not change it for anything! I am SO thankful God has called us to this life. This life with more intangibles than I could ever list, and more blessings than a million dollars could ever hope to buy. This life where I love my friends and family who encourage me daily. This life where my children help with the housework, where my husband willingly goes to work to provide for us, this life where I even have time to occasionally read a book. This life I lead is blessed. Thank you Jesus for my life, and thank you friends for being a part of it! Have you ever struggled with what to have your young teen read? We have. There comes a time when they're too mature to really enjoy chapter books, yet as a parent, you hesitate to have them read too much adult literature because of the themes. 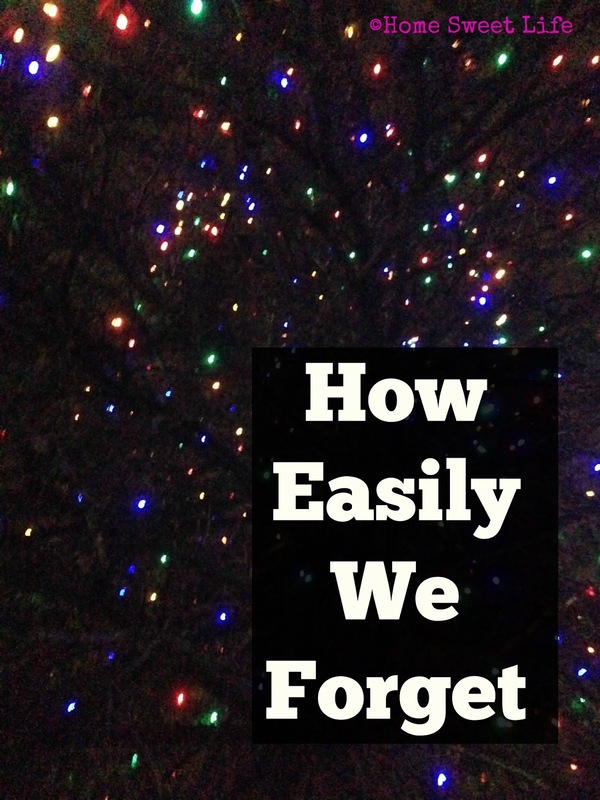 We found a quality choice for these middle years in the book we've been reviewing for The Schoolhouse Crew from the Circle C Milestones series. 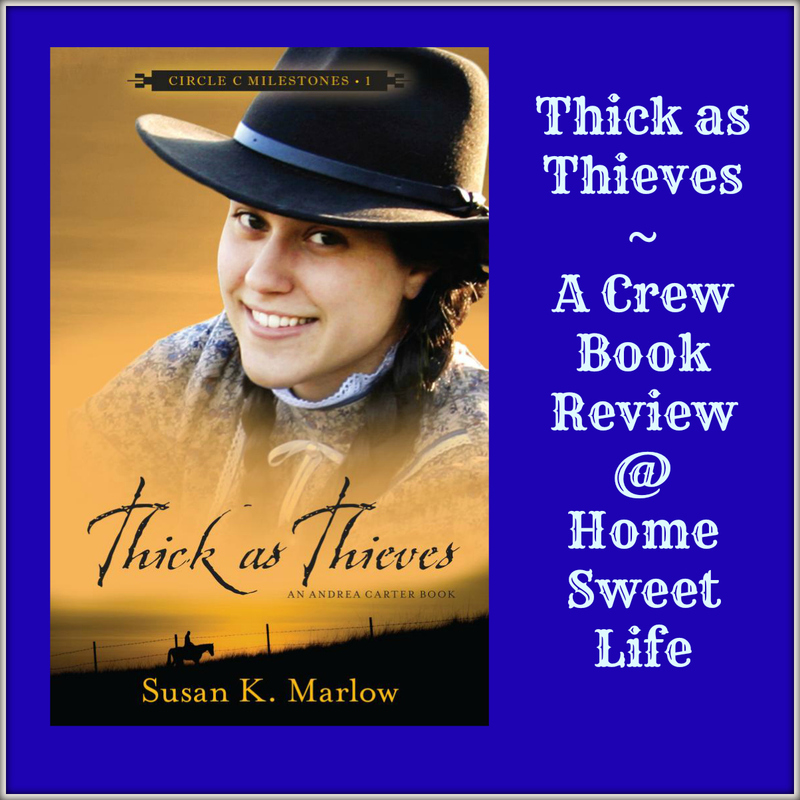 Susan K. Marlow's newest book Thick as Thieves follows the life of 14 year old Andrea (Andi) Carter. Andrea is the youngest sibling in a big cattle ranching family. The story is set in California in 1882, and opens with Andi's concern for her mare Taffy as the time approaches for her first foaling. If you or your children are not familiar with horse and ranching terminology, don't fret, you can download the 40 page Thick as Thieves Study Guide to help you better understand and more thoroughly enjoy the book. More on the study guide later! Since Arlene is 14, and like horses, it did not surprise me that she took off to her room with the book and finished it in just a couple days. I also read the book, and enjoyed it. The plot is deep enough to hold your interest, with just enough on-the-edge adventure that you don't want to put it down. I appreciated the care given to how the book portrays Andi's inner struggles with everyday life. When a new girl comes to school, Andi is faced with the tough decision of acting with compassion or selfishness. This new girl, Macy Walker, has lived such a vastly different life than Andi that there is a serious gulf in the two girls' outlooks on life. As Andi realizes the contrast between the loving but sometimes strict family she has grown up with, and the lack of care Macy has received from her no-account brothers, her compassion grows and valuable lessons are learned. This book does a solid job of portraying how Andrea's character is molded by her family, her faith, and life lessons without being preachy. The 40 page study guide would be a valuable resource for many families, especially if you use this as a read-aloud for a range of ages. The study guide divides the book into sections of just a few chapters each. Each section has some vocabulary exercises, plus some questions for digging deeper into the characters, the plot, or your study of horses. There is a variety of activities to help, from crossword puzzles, matching exercises, and even further reading ideas. While Arlene already knew what all the horse terminology meant (thank you summer camp,) if your reader is younger, or hasn't been around horses much, this could be a great asset. At $9.99 for a 173 page paperback, plus a free downloadable study guide, this title is worth a look. I would recommend it as an independent read for ages 12 and up, if your horse lover is younger, or you have a variety of ages, this would make a superb read-aloud. Arlene and I discussed that we would have liked a list of characters in the front of the book. Susan Marlow has written other books about the Carter family, and even though it isn;t necessary to have read any of them to enjoy Thick as Thieves, it took each of us a coupe chapters to sort out who was who in the story. Thick as Thieves is the first book in the newest Andrea Carter Series . In case you don’t know anything about the books they are about a girl living on her family ranch just outside of Fresno California in the 1880s. The book starts when Andrea’s horse gives birth to twin colts, and follows her life between going to school and raising the colts, and what happens when cattle thieves steal their and other ranchers' cattle. The books are for ages 12+ however if you have younger children who you think might enjoy similar stories Susan Marlow has two other series: Circle C Beginnings for ages 6-9 and Circle C Adventures for ages 9-14. 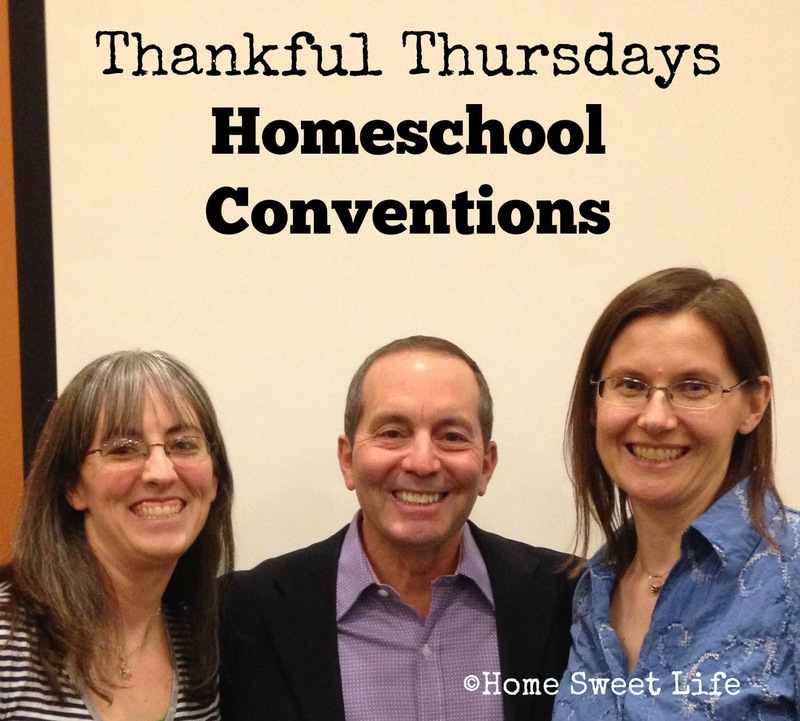 I am thankful for Homeschool Conventions. Many state and regional groups host conventions, and if you live too far away to travel to one, you can even attend an online convention. If you're wondering why I am thankful for a convention, consider this: where else can you learn from so many different speakers and view so many types of curriculum and hands-on activities in just a day or two? I've been to a few homeschooling conventions. The picture above is from the Great Homeschool Convention in Cincinnati last year. On the left is my friend Bethany, and in the middle is Jim Weiss from Greathall Productions. A few years ago Bethany and her sister-in-law introduced me to Jim Weiss' wonderful story CD's. I went to one of his speaking sessions and I was hooked. Our girls have amassed quite a collection of Mr Weiss' CD's since then. I enjoy listening to them too. Jim Weiss' CD's are one part history, two parts story and three parts fun. If you grew up in the 70's or 80's, your parents might have listened to the singer Andy Williams, Jim Weiss' voice reminds me of those Andy Williams records my parents had. Besides being a master storyteller, Mr. Weiss is a fun guy to be around. Arlene and Emily wanted to know what he looked like, so I asked if Bethany & I could take a picture with him after his speaking session. FYI- he's short. That's ok because it puts him closer to eye level with all those children he entertains! I've heard convention speakers talk about learning styles, teaching methods, record keeping, and a lot of other topics. Going through the exhibit hall can be a bit daunting if you're new to educating at home. The best advice I ever received was "look, but don't buy your first day there." In the dozen years we have been educating our girls, the amount of curriculum choices has grown exponentially. Many books are not necessary to teach your children, but sometimes it's nice to have all those choices. 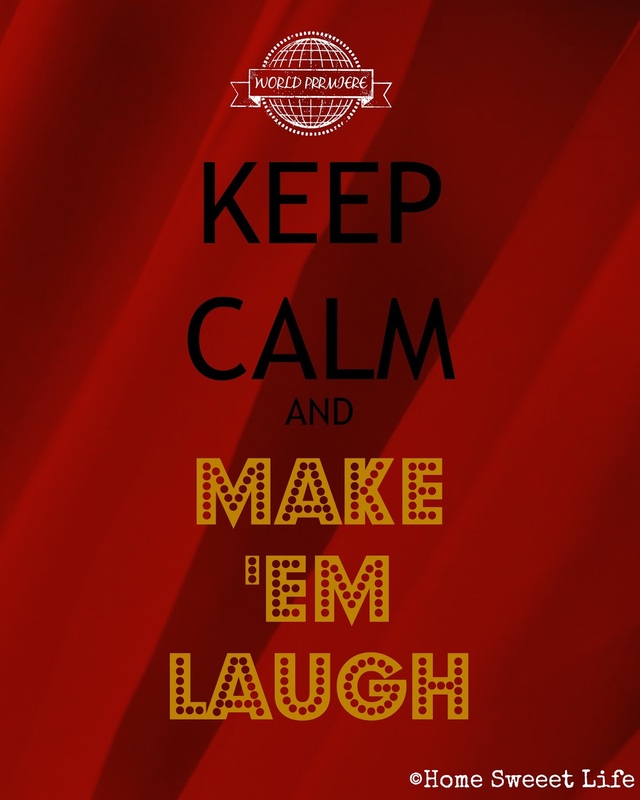 The variety in the convention exhibit hall can even help you choose what NOT to do. We still make great use of our library card! Don't be fooled into thinking you need a curriculum for every subject. Choose wisely and stick to your budget. Last year I spent time at the exhibit hall making sure that the geometry curriculum I had chosen from online sample pages was really the one I wanted the girls to use. If you have the opportunity to attend a convention, I encourage you to go. It may not be something you do every year, but it can be such a time of encouragement and refreshing. This is the time of year I could use some encouragement to keep going! 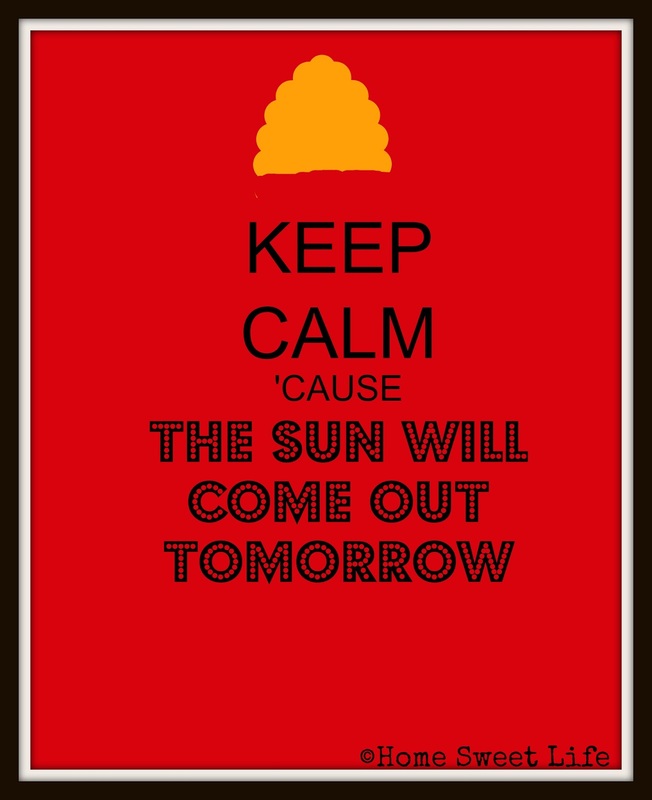 I am thankful our state homeschool group's convention starts tomorrow. Stop by again next week, we can both use the encouragement to be thankful! 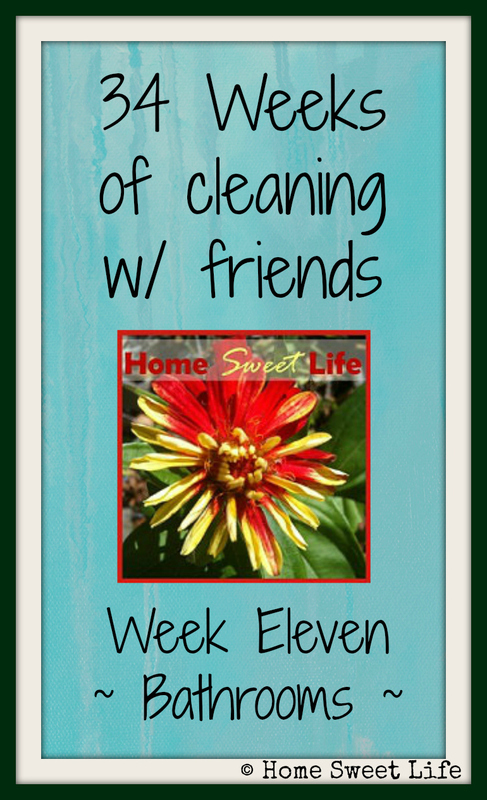 Michele gave us the task of cleaning and decluttering our bathrooms for week 11. Since Emily & Arlene clean the bathrooms twice each week, there wasn't a lot that needed done on the cleaning part... however, the decluttering needed some help. Our upstairs half-bath was my targeted area for this week. Since our 105 year old house is short on closets, a lot of things get stored under this double sink. The left cabinet is for cleaning towels and extra shampoo, plus a couple items that don't fit anywhere else, like the foot bath. Yes, those are baby wipes. They clean as well as the fancy bathroom wipes, but they're less toxic, and a whole lot cheaper! All this cabinet really needed was some TLC. Once I sorted the towels by size, and moved the ones for the kitchen back downstairs, it was a snap to put everything back in the cabinet again. 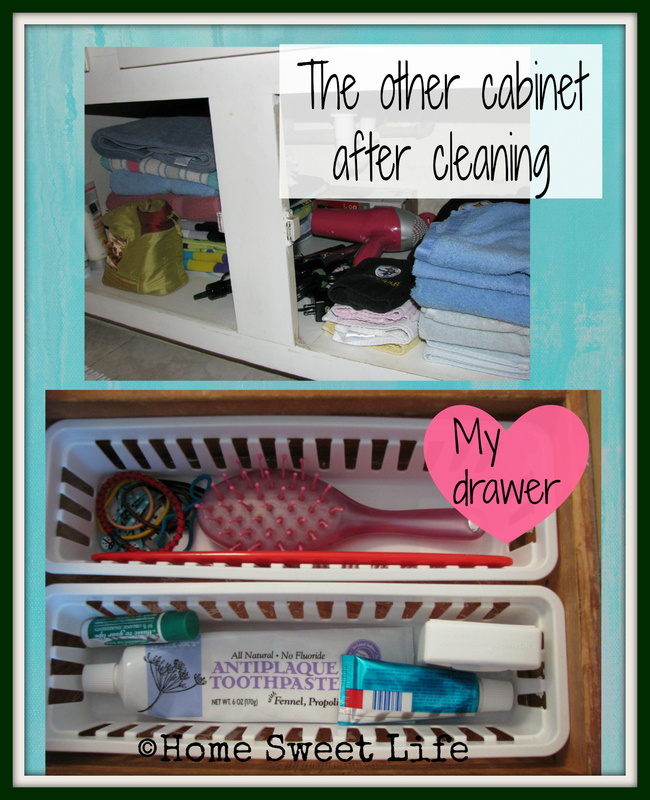 The other cabinet holds our extra bath and beach towels, plus my hairdryer and curling irons. That side stays neater, since there aren't as many small towels to get shoved around. After the cabinets were finished, I decided to clean out my drawer. The girls and Kurt will have to do their own drawers. I threw out some broken barrettes and cleaned out the random hairs that get away from the brush. Overall, this wasn't a difficult task, I just needed to set aside the time to get it done. Next week's task is the DVD's. Hmm... that might take more time. 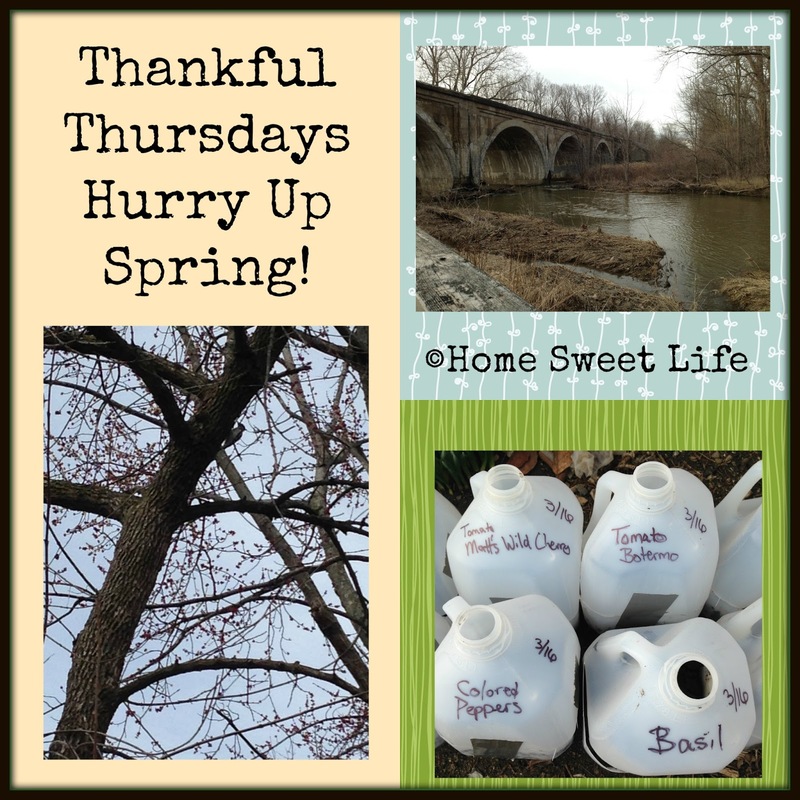 Thankful Thursdays - 3/19/15 - Hurry Up Spring! The weather was nice earlier this week, and we finally got a chance to have fun outdoors! In the midst of it, we got lots of exercise, and absorbed a lot of sunshine - both wonderful reasons to be thankful! On Sunday evening, we dropped the girls off at a local park to play Ultimate Frisbee with their friends. Kurt and I spent the time hiking around the trails at the park, including one of our favorites that goes under the train bridge. We saw several pairs of mallard ducks, along with a few other brave hikers... it was a bit muddy. The creek was running swiftly as it had not only snow melt, but also rainwater from Friday and Saturday. On Monday afternoon I went out on the front porch to do some Winter Sowing of Tomatoes and Peppers. Yes, it WAS still Winter sowing even if I'm about a month behind my usual schedule because Spring doesn't arrive until tomorrow! While outside I heard the distinctive rat-a-tat of one of our woodpeckers. I guess even the bugs are moving around waiting for Spring to arrive! I hope you had a wonderful week, and found many things to be thankful for! Week 10 - The Entryway... 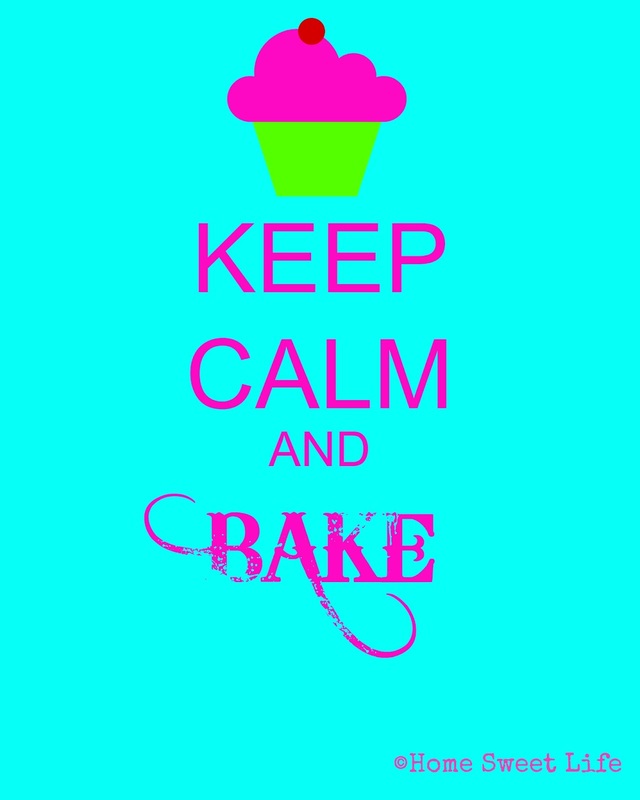 Wherever it is! 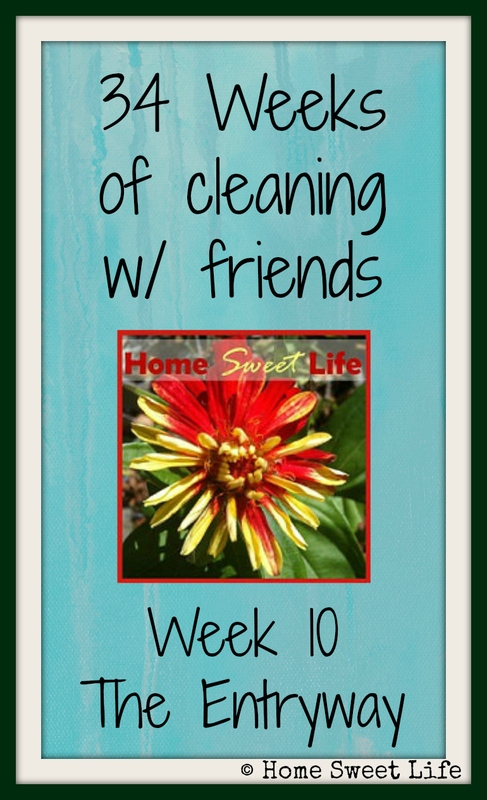 The cleaning and decluttering challenge for Week 10 was the entryway. I know, those of you that have been to our house know that you walk in the front door directly into the room... there is no entryway. 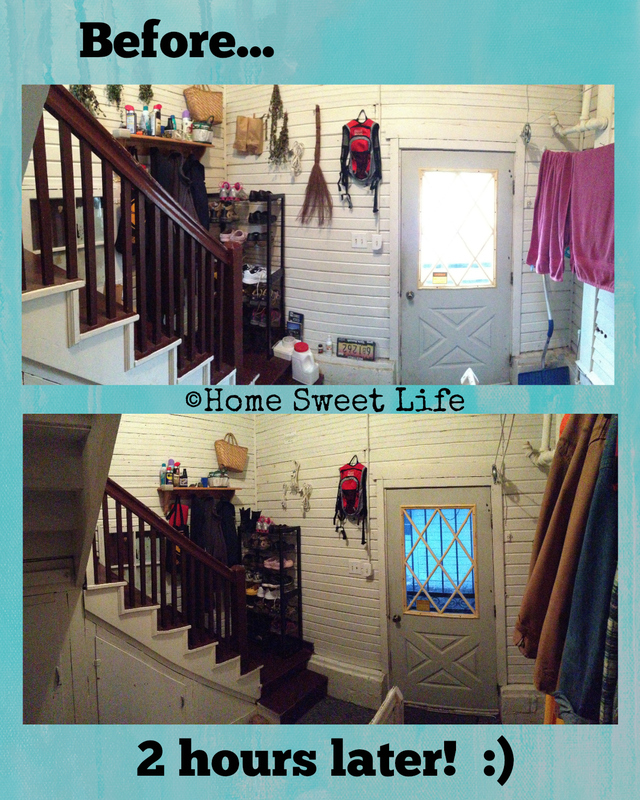 However, people that come over often know we use our back stairway/mudroom as our main door. It's right by the garage and driveway. It makes more sense to use this as our primary entrance since it is the shortest distance from where we (or any visitors) park our cars. In the winter it also gives us that necessary buffer zone between the living space and the cold outdoors. I decided that this qualified as our "Entryway" so I cleaned it yesterday. First, a little background on our home. Our house was built in 1910, so at 105 years of age our idea of clean might be different than yours if you live in a newly built home. Secondly, this room is the catch-all because it contains two staircases (one going up to the back bedrooms and one going down to the basement... and the laundry.) The third important point to remember is that in the 10+ years we have lived here... it has probably only been cleaned 4 or 5 times, and I don't ever remember wiping down the walls before. That's right, this is the area we try to forget about when it's cleaning day-LOL! It wasn't as difficult to clean in here as I though it would be. That being said, when I finished, I threw the cleaning towels away instead of washing them because they were just that disgusting! First I put things away where they belong... the snow shovel and ice melt went to the basement instead of the garage because Winter probably has one more hurrah left for us. (On March 1st we received 7" of snow - not our normal, but we often get measurable snow in March here in Indiana.) I decided it was way past time for my dried herbs to make it to the pantry, so I took a small detour & put them in labelled jars. Then we took some things to the garage, I did enlist some help from Emily since she was going outside to the recycle bin anyway. I dusted the walls and swept with the vacuum. The stairs were still filthy so I sprayed them with Murphy's Oil Soap and wiped them down... even the banister spindles! Things were looking so much better that I decided to wipe down the walls with another natural cleaner that cuts through grease well. This morning my arms hurt from the scrubbing, but it looks and smells so much nicer that it was worth it! The final step was to find the Magic Eraser to help with the stubborn spots on the doors. This is when I realized I hadn't done the other side of the door to the dining room back in Week 7, so I did both sides, and the edge. It was gross, but it's much better now! After two hours of hard work...or maybe a little more, I called it finished and decided to watch a movie with the girls. This morning I got up and started on bookshelf #4. With 14 of them to tackle, this saga is going to take a while! Emily and Arlene were forced to sort through all their 4-H papers and put them in their achievement books. I found five more books to try to sell, and I actually organized the books by kinds. The picture doesn't do it justice, but I will be able to find things quickly now. That is a wonderful feeling! 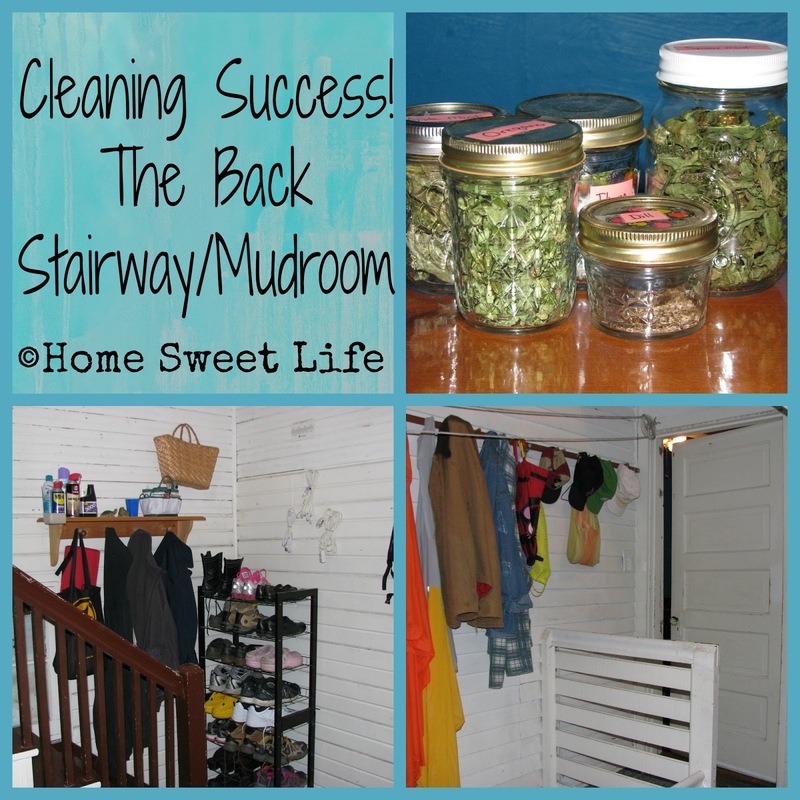 How did you do with cleaning this week? I'm really glad I joined Michele on this decluttering journey. I feel like we're taking our house back one step at a time. It's starting to feel like a home again, not just a building with stuff in it! Don't give up! You can do this too, just take a reasonable sized bite to work on each week! Check back in next week and see how we did on the bathrooms! I knew this week was coming. We were going to have to face the bookshelves in our house. I just didn't expect that Michele's challenge would come on a week that was so full of everything else as well. I knew weren't going to get them all sorted this week. After all, we have 14 bookshelves of various sizes around our house. Besides schoolwork, and church, we also had a lot going on this week... a trip to the art museum, a day of spinning for Arlene, watching bald eagles come in to roost, and group Literature class for the girls. 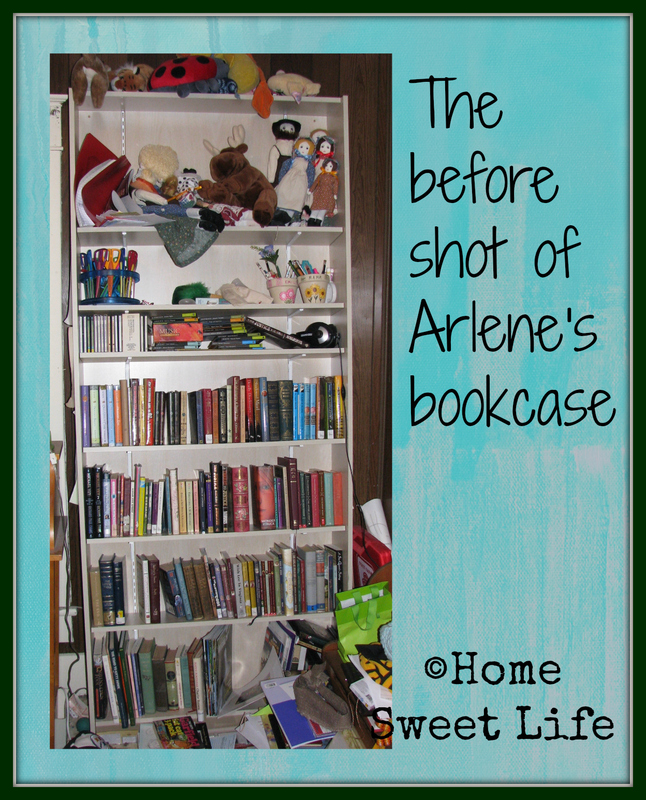 At least two of the bookshelves had already been conquered in the kitchen and the living room. The issue was with all those other rooms. 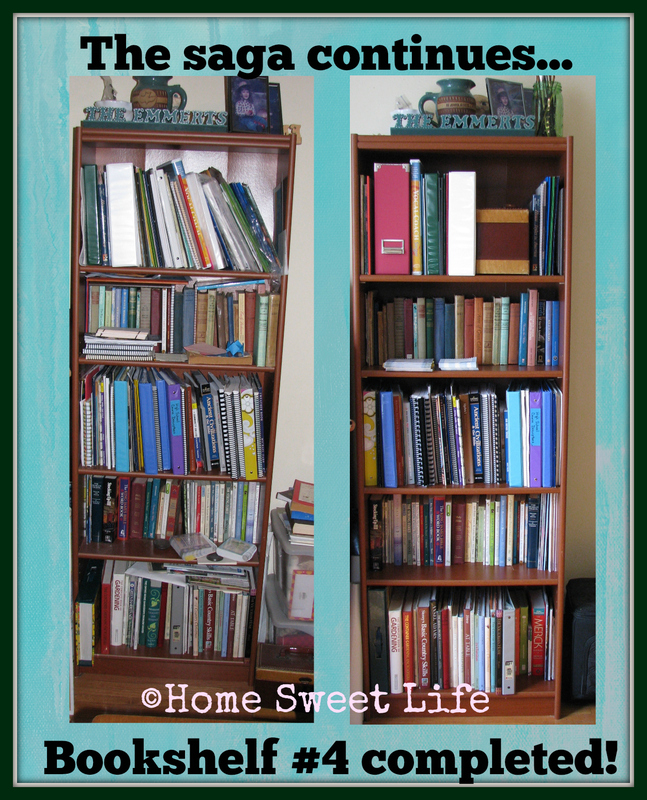 Besides the bathrooms, the only room without a bookshelf in our home is the dining room. So what to do about the vastness of this week's challenge? 1- hand it off to the teenagers OR 2- cut it up into bite-sized pieces... OR 3- do both! I opted for #3 since I was hardly ever home this week to work on it. I figure if we keep on working on one bookshelf a week, we should be finished by the end of May. This week the girls tackled the bookshelves in their room. As I type, Emily is still working on hers, but Arlene came in just under the wire so I could show you what was accomplished. 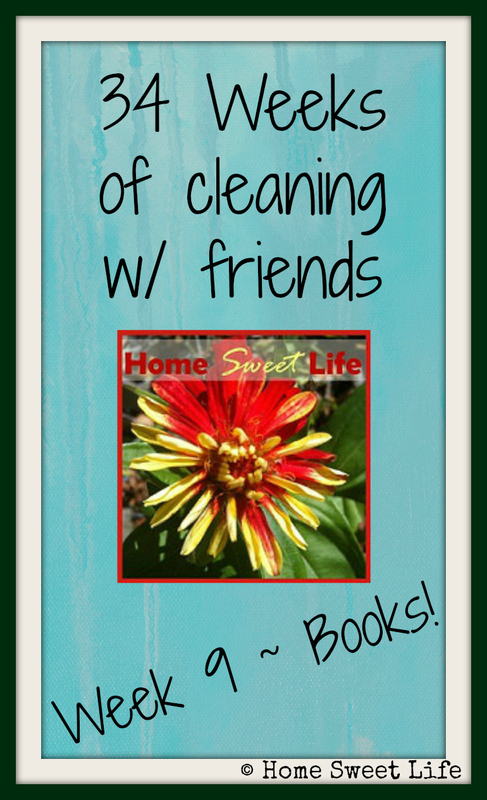 If you didn't get all your books cleaned & decluttered this week - don't panic! 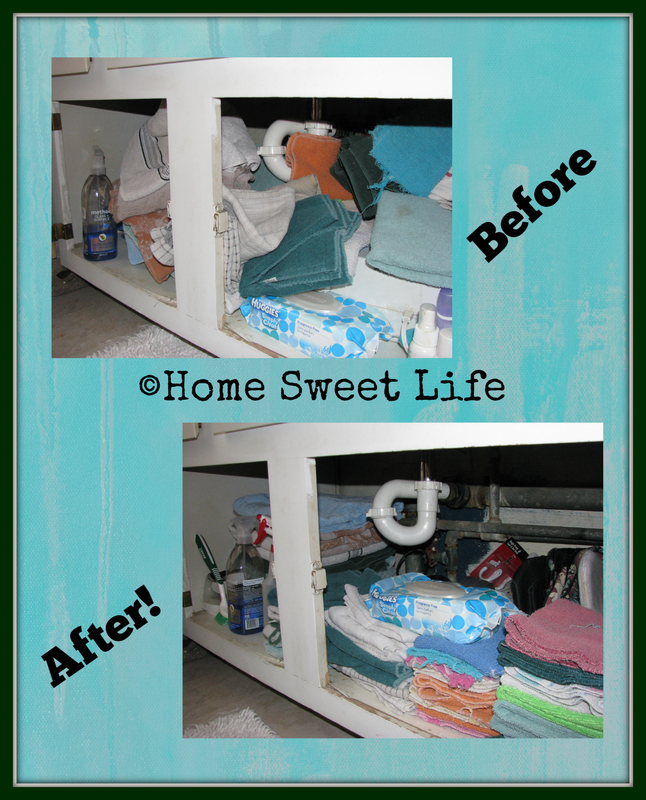 Our goal is a less cluttered, cleaner house in 34 weeks. 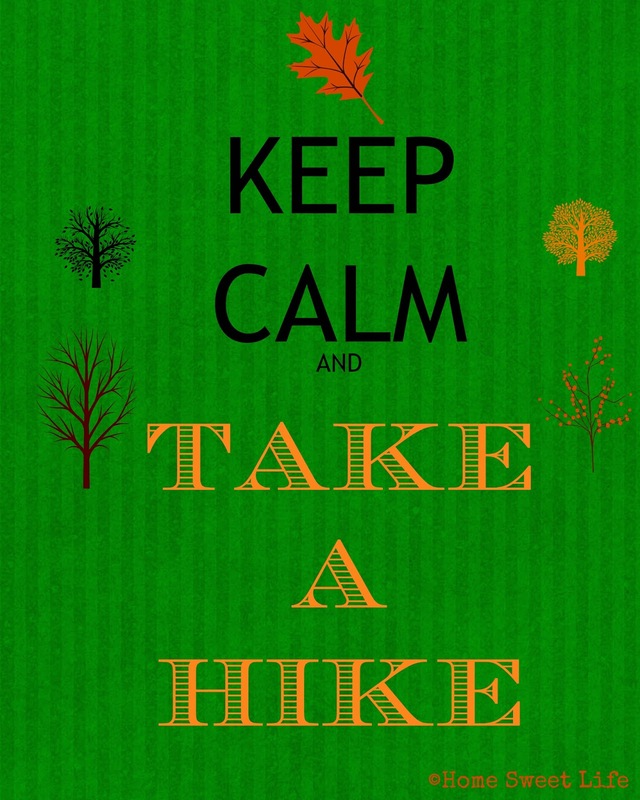 Just keep picking a task and working on it each week. You will be glad you did! 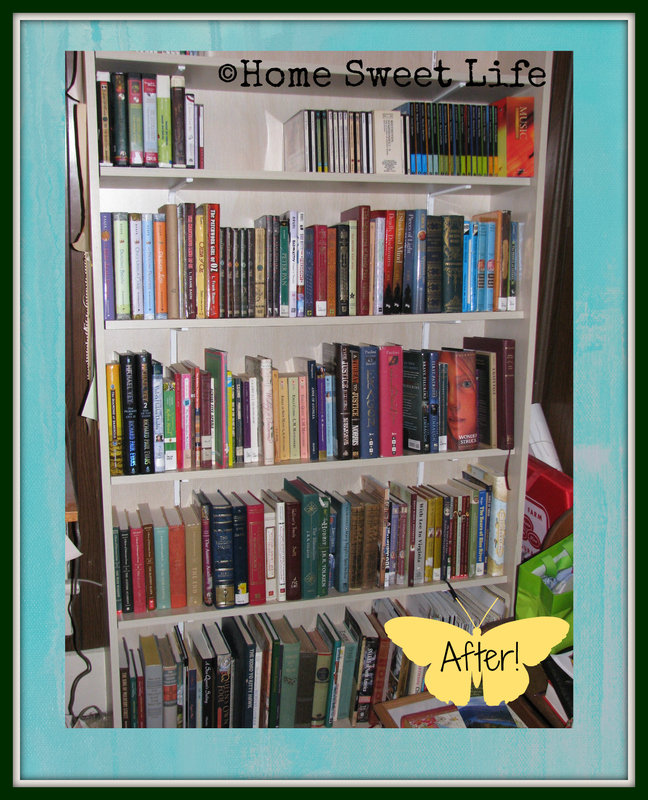 I'll try to remember to post pictures of the other bookshelves as we get them sorted and cleaned. I'll probably find some good books to sell as well, so keep an eye on our Facebook page! We are thankful for museum gardens. Those gardens that look spectacular most of the year, that require no effort on our part but to simply enjoy them, those are ones to be thankful for today. Later in the year I'll be thankful for my own garden. Many museums have a variety of gardens to enjoy, and several let you visit the gardens at no charge. When I read books about manor houses, I think of gardens I have seen at various museums to give my imagination wings. While our yard is too small for a large, showy garden, museum gardens are often large and lavish. The picture above is from a recent visit to the Indianapolis Museum of Art's gardens. It was just a moment in time that Arlene and I sat down to chat...and I asked her sister Emily to snap a photo. So rarely am I in a photo because I'm usually the one taking the pictures! I thought it would be nice to have a picture of me and my almost 15 year old baby-girl. Museum gardens give us space to walk and imagine, they often have great subject matter to draw, paint, or photograph, and the larger ones give us plenty of exercise room as we walk from end to end. 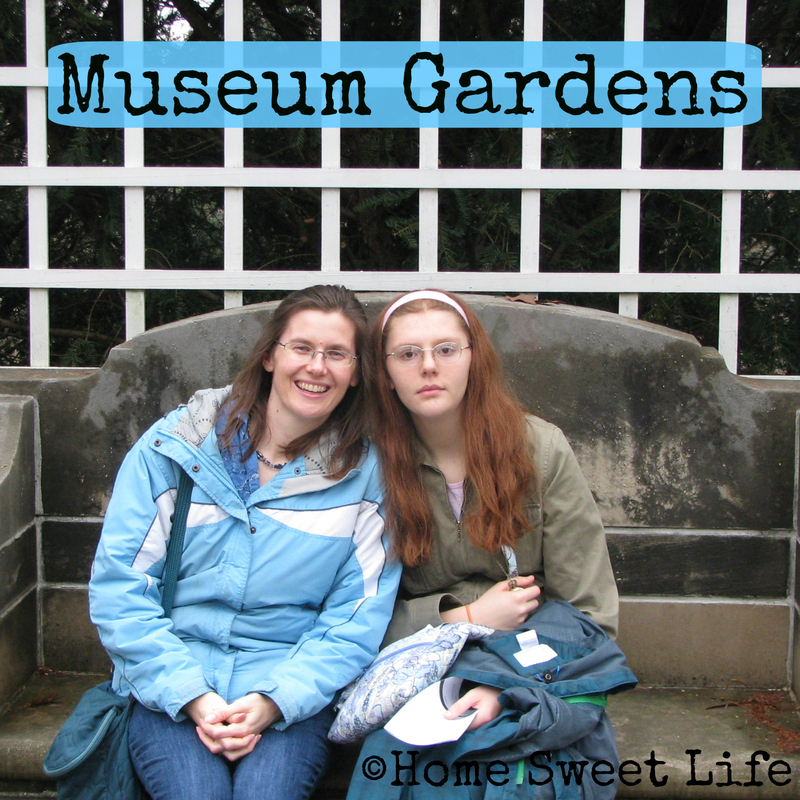 I've found that if you like the garden, you'll probably like the museum. Spring is just around the corner - why not scope out a local museum's gardens and watch life unfold? Perhaps its time for a little nature study, or a little art class. Or maybe, just maybe, you need the quiet solitude of the garden to regroup. Whatever your reasons, find a museum garden to call your own this year! I am thankful for a recent winter's night. The world was still, the moon was full, and I was in no rush to go anywhere. I sat and looked out the living room window at the clear sky, the quiet snow, and the moon through the trees. Looking at the pictures I took that night reminded me that we are to be thankful, all the time. Some days it's easier to be thankful than others, yet the Bible clearly commands us to give thanks. Find something to be thankful for. What ever you do, give thanks. If you are in a difficult situation and don't feel thankful, choose to be thankful that you are not there alone. God is there with you! 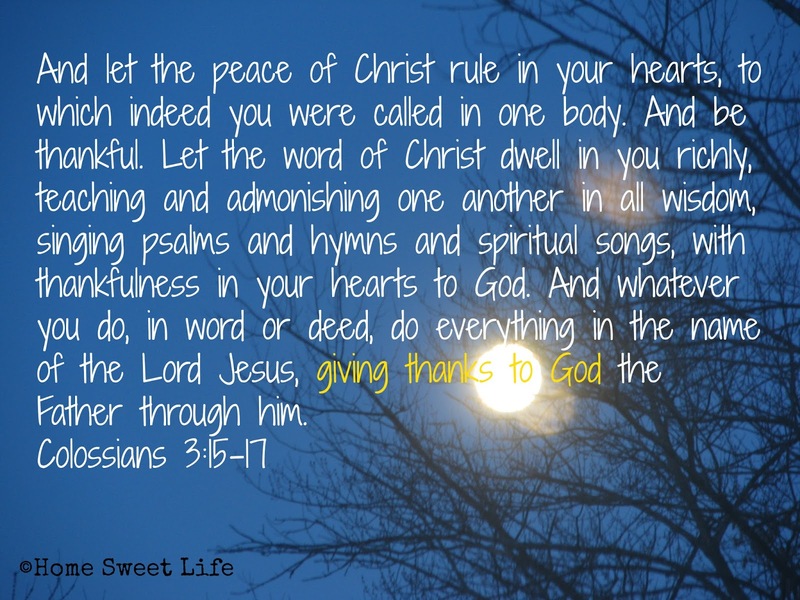 Choose to sing a Psalm or a hymn, and ask God to help you be thankful. Someone needs to see that joy in you that can only come from Jesus! Do you ever feel like a character from a movie? Sometimes I feel like Dorothy from The Wizard of Oz. No, I'm not talking about the part where the flying monkeys are after her, I'm talking about the poppy fields. The part where Dorothy gets so sleepy she forgets her mission. How easily we forget our mission. How easily I forget that tying heart strings is more important than a clean house. How easily I forget that I should be putting my husband second only to God. How easily I forget that God puts people in my path because He wants me to tell them about Jesus. If you've been feeling like Dorothy, and you've gotten so sleepy that you've forgotten your mission, its time to wake up! It's time to put God first again and keep Him there. It's time to see every interaction with others as a chance to shine the light of Jesus. It's time to stop beating yourself up and instead extend some grace. It is often easier to forgive others than to forgive ourselves. We need the reminder that God has placed our sins as far away as the East is from the West. It is only the beginning of March, but I think a lot of us have forgotten the joy and peace of Christmas already. We have forgotten our wonder at the marvelous story of Jesus coming to earth as a baby to prepare a way for us. We somehow want to hurry our lives along to some future point, yet in doing so, we've forgotten that our days are ordained by God. We cannot give ourselves any more time on this earth than God has allotted to us. May we choose to slow down and listen. God is speaking. The book of Isaiah reminds us in chapter 30, verse 21 about listening for His voice: And your ears shall hear a word behind you, saying, “This is the way, walk in it," when you turn to the right or when you turn to the left. Are we listening? Am I listening? May I no longer count the seasons by the weather outside, but by the work God is doing inside my heart and mind. May each new season draw me closer to Him. May each passing season have me listening to His voice. My desire is that I would no longer be so quick to forget His Word and His plan. May I walk forward along God's path. I do not want to be a forgetter, I want to be a rememberer. I want to remember all Christ has done, and continues to do. May I follow Christ's example of a life devoted to showing God's glory. When is a flower more than just a flower? Every single day. Sometimes we receive flowers from a friend or a loved one. That gift of flowers might be in celebration of a special event like a birthday or anniversary, or it might be a 'just because' gift. 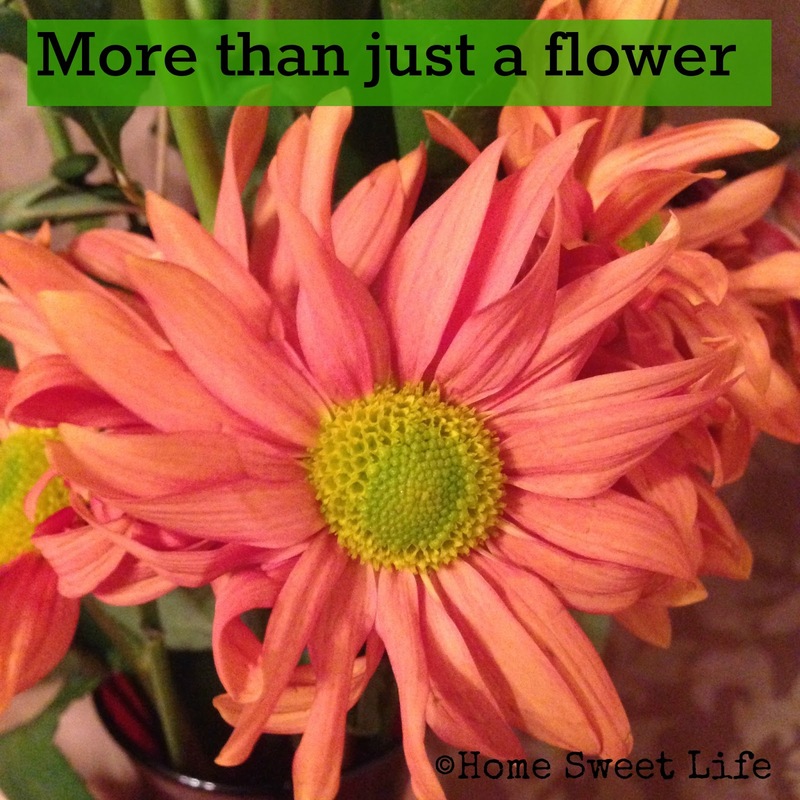 Sometimes we buy flowers at the store because we want to cheer ourselves, or brighten a room. There is a special joy in taking time to really look at a flower. A flower is a masterpiece created by God. Whether the flower grew in your own yard, along the side of the road, or in a greenhouse, it is still a masterpiece. Flowers contain minute details and intense amounts of color. 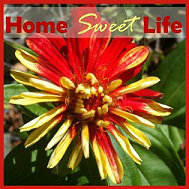 Whether they are 1/4" or 6" wide, flowers take time to grow and mature to be able to bloom. Maybe we can learn something from the flowers that brighten our world. People take time to grow and thrive. We are masterpieces created by God. We are his workmanship. We can brighten a room, or celebrate with others. Unfortunately, just like we can ignore flowers, we sometimes ignore people. Maybe we think they are too small to require our notice, or too showy. Maybe we think they need more care than we are willing to give. That is not what God wants from us or for us! God wants us to take the time to see and appreciate His workmanship, whether flowers or people. God has placed those people in your path for His purposes. Maybe those small people (like your children,) are there to teach you about patience and trust, maybe those showy people are there to teach you about joy. Take time to get to know the details about the people God has placed in your life. Ask Him to show you His hand at work maturing them. Ask God to help you grow. If you are too busy to notice a flower, then you are too busy to notice a person. A flower is more than just a flower when God uses the flower to remind you to slow down. It matters not if it is a rose or a dandelion, stop and smell the flowers! See the amazing details God has placed in each and every flower. As you learn to slow down to appreciate a flower, you will learn to see the amazing details God has placed in each and every one of us. Our days on this earth are numbered, fleeting actually, spend each one appreciating the beauty God has designed. Mark 8:36 is a daily lesson for us to learn - "For what does it profit a man to gain the whole world and forfeit his soul?" Grasp not for the world, for it is fleeting. Grab hold of God, for He is eternal! 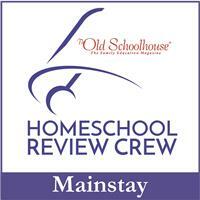 We have been blessed many times over the years to review products with The Schoolhouse Review Crew. Most of them are educational, either curriculum, games, or supplementary programs. Every once in a while we get one that is NOT for the girls to review, its just for me, the Mama. I call those happy reviews, ones I can keep for myself, or share if I think they would be good for everyone. Our recent shipment from Koru Naturals was one of those happy reviews. We have spent the past ten years or so trying to convert as many personal care products as possible in our house over to all-natural ones, so we are always on the lookout for new ones to try. We received two outstanding products from Koru Naturals, their Emu Oil, and a four-pack of tubes of their Pure Lanolin Lip Balm. I was really nice and shared. :) Kurt, Emily, and I all tried one of the lip balm tubes, and the girls and I shared the Emu Oil. Yes, that does leave one more lip balm... that one I'm not sharing. The first thing we noticed about the lip balm (retail price $9.80 for a 4 pack) was how thick it is. I know, that shouldn't have surprised us, as we've used lanolin before. I guess we just didn't think about how it would be to put it on your lips as opposed to on your hand or arm. My recommendation is to use this as a dab it on lip product, instead of a swipe it on balm. If you swipe it, you could end up with a lot more than you need, and might be like the first time Kurt tried it... "mmm, I think my lips are stuck together"-LOL! These tubes (also available in pots if that's your preference,) are simply 100% pure anhydrous lanolin. That means no water, no perfume, no weird flavors. This is just the kind of lip balm we needed this winter. It has been particularly cold and dry the past two months, and these worked really well. Because the lip balm is just lanolin, it keeps the moisture you have inside your lips, and protects them from the wind. Kurt liked these because the lanolin stays on. You're not always reapplying like with other natural lip products. We received the box just over a month ago, and even after using this lip balm at least once a day, it seems like I've hardly used any at all. Emily wants to remind you that you could put it in your pocket to soften it up, but don't leave it there too long or it will get really soft and you'll end up applying too much. I was a little concerned that if I left it in my pocket, I might forget it. I don't think lanolin and laundry would mix well. Emily sometimes likes to use natural tinted lip balms, but they often dry out quickly, so she used this lanolin lip balm from Koru Naturals over the top of her tinted balm to seal in her lip's moisture. I also want to mention that this is the most portable form of lanolin I've come across. That is great news for people who might have fingertips or knuckles that tend to crack in the winter. Just toss it in your bag and take it along. Choosing the Pure Lanolin Lip Balm in pots would be a great gift idea, especially for new Moms, gardeners, or outdoorsmen. Also, since they come in a four pack, you can share with your family without sacrificing your own tube. I am a fan of lanolin. In the summer when the girls are volunteering at the local living history park, I often go see the lambs in the barn. I love running my hands over their fleece and feeling how soft the lanolin makes them. If you've been around sheep, imagine this lip balm as the clean version of kissing a lamb on the head. 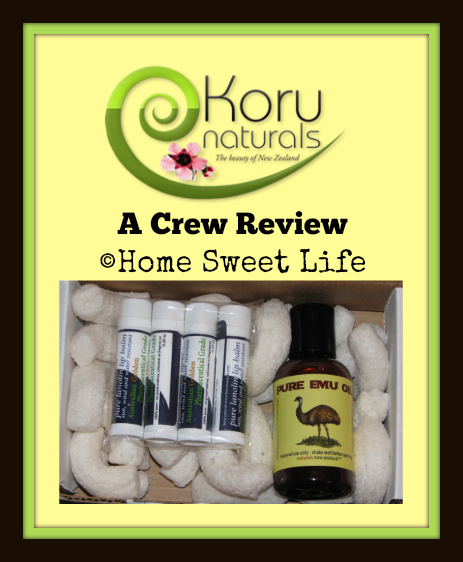 The second treasure in our box from Koru Naturals was a 2oz bottle of fully refined natural Emu Oil. Where has this been all my life?! I'm a huge user of natural oils for skincare. Usually I spend each winter slathering my dry face with coconut oil. Coconut oil works great as a moisturizer, but it leaves you feeling a bit greasy. Emu oil does an even better job of moisturizing my skin, without the greasy feeling. This Emu Oil (retail price $9.85 for 2 oz) looks milky white, has a very mild, almost unnoticeable, smell, and works tremendously! A little bit goes a long way... a really long way. Emily and I have used this every single day for the past month, and we've maybe used half an ounce. I've been using it once or twice a day on my face, and several times a day on the ends of my fingertips and around my cuticles. Usually in the winter I have to break out the lanolin and wear cotton gloves to bed every single night to keep my fingertips from splitting. This month I've been using the Emu oil about four times a day, skipping the lanolin, which, by the way, you should not use on your hands when you're using electronic devices like your phone or laptop, and have hardly ever needed to wear gloves to bed. Arlene says the Emu Oil is magic. She had a couple spots on her scalp with some dandruff that wasn't going away even when using dandruff shampoo. I used just a few drops of the Emu Oil on those spots and by the next morning they were 80% gone. I like how well moisturized the Emu Oil makes my face feel. It only takes a few drops for my whole face. Since the weather has been super cold and dry, or cold and snowy all month, this came at a great time. Emily has been using the Emu Oil on her psoriasis. She frequently gets small outbreaks on her arms, either near her elbow, or near the wrist. Using the emu oil twice a day has made as significant improvement in her skin. This refined Emu Oil retains the Omega 3 and 6 essential fatty acids. I think if you struggle with any type of dry skin you should give this a try. If you decide you want to use it as an all-over body moisturizer, you'll be glad to know it comes in various sizes, 2, 4, or 8 ounces. Overall, we were quite impressed with the quality of both of the products we received. Koru Naturals has many more products, some of which were reviewed by other members of the Crew. 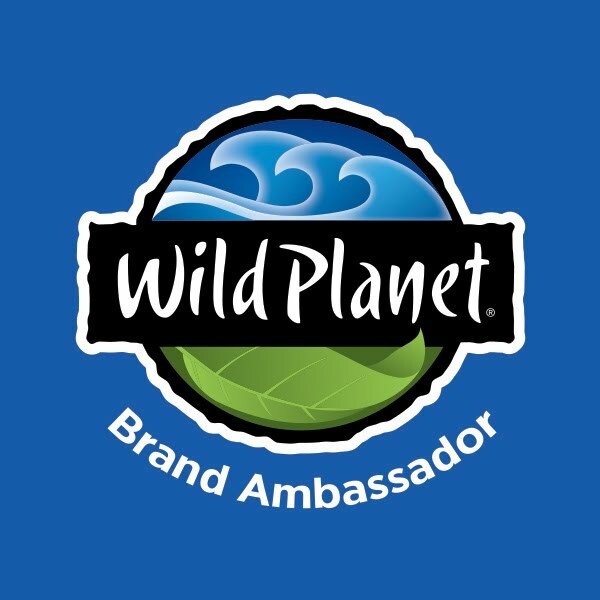 Click on the banner below and join me in reading about Koolpurrie Restoring Balm, New Zealand Pure and Simple Lanolin Cream, and Manuka Oil and Honey Shampoo and Conditioner.